AN stands for Army-Navy, and its name alone will answer the question: They’re military-grade parts that work in the aviation world. They’re also the standard of motorsports for plumbing all kinds of fluids. 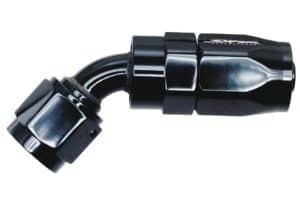 AN fittings use a 37-degree flare, while most automotive fittings use 45-degree flares. They’re not interchangeable, but adapters are readily available. Steel and brass pipe fittings are more commonly found at the local hardware store, while AN fittings are—for most of the U.S.—a speed shop or mail-order-only part. Buy AN Fittings: If you never want to worry about your car’s plumbing again. Buy Pipe Thread Fittings: To save money and you can fix your car in a hardware store parking lot. Figure out how much power you want—or need—and see if it’s available in crate engine form. If so, buy it! Crate engines are the best way to get horsepower especially when brand authenticity, bragging rights, or restrictions aren’t an issue. If you want to micro-manage every detail and part installed in your engine then go to a machine shop. If you do buy a crate engine, make sure it’s from a reputable source like Summit Racing, Chevrolet Performance, BluePrint Engines, or Smeding Performance. Buy a Crate Engine: If what you want is already mass-produced and comes with a warranty. Go to the Machine Shop: If you want to specify every single aspect and part of your engine. 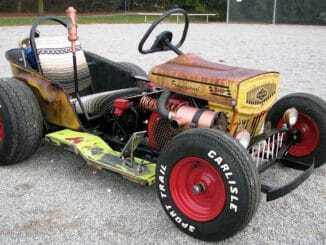 An entry-level 120-to-150hp wet-nitrous system from Zex or NOS that fits a typical carbureted V8 costs around $600, and a single-carb Roots blower costs around $1,600. 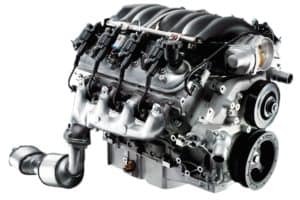 Intake-air temperatures become a self-limiter for superchargers when they are at their maximum boost output—unlike nitrous which basically acts as a chemical intercooler for the intake charge. Standard nitrous kits include a 10-pound bottle, which usually refills for about $30 to $50, depending on where you live. That boils down to 14-24 refills to equal the same price as a Roots-style blower. According to Nitrous Supply, a 10-pound bottle with a 125hp shot will make as many as 10 quarter-mile passes before going empty. You’ll have to make 98-240 quarter-mile passes—depending on how friendly you are with your nitrous button—before you reach the cost of a Roots blower. Buy Nitrous: If you want power on demand and like to visit the dragstrip. Buy a Supercharger: If you want power all the time, for a long time. If you have the weekend street/strip car, a manual transmission will usually be stronger for you, as the clutch often takes the harshness of competition. Clutches are far easier to replace than repairing the internals of an automatic. For the more serious racers, though, upgraded automatics are the only way. The biggest upside with an auto is the ability to spray nitrous for an entire dragstrip pass and no one can shift faster than a well-tuned automatic transmission. Buy a Manual Trans: If you are a street/strip guy. Buy an Auto: If you’re a serious racer and can afford to upgrade it. If you’re on a budget, a late-model car is a better choice. Banks will loan you money when you’re purchasing a newer car, and you should have fewer unexpected mechanical surprises. A collector car needs a separate budget. Don’t fool yourself. If you only have $5,000 in a jar, don’t buy a $5,000 car. Buy a $4,000 car and anticipate unforeseen circumstances. Buy a Late Model: If you need a loan and need to drive the car everyday. Buy a Collector Car: If you’ve saved up enough money to buy a well-sorted driver. Glasspack mufflers are cheap and their lack of restriction makes for great sound. Schoenfeld’s header mufflers and off-brand glasspacks sell for around $20. Most performance exhaust creates interior drones that, with frequent driving, become a major headache—literally. Only expensive brands attempt to reduce the drone. Quiet mufflers are more costly, but won’t get you the sound or performance you want. Buy Race Mufflers: If you have no respect for your neighbors. Buy Quiet Mufflers: If you drive it a lot. 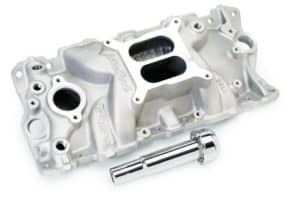 Carb spacers can work to tune intake plenum volume for a few more ponies—but if you still have a factory manifold, you’re better off investing in a new intake. The cost versus reward is far greater. New aluminum intakes are around $130, and small-block intakes are common at swap meets. An intake can make a world of difference in drievability and power. Don’t buy one blind though, do your research and—again—buy a reputable brand. 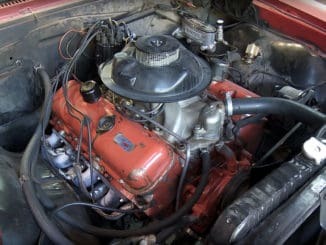 Buy a Carb Spacer: If you already have a performance intake you’re looking to tune. Buy a New Intake: If you have a cast-iron 2bbl intake. 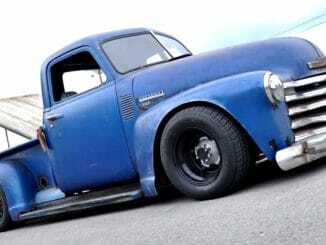 Bolt-on fuel-injection systems are on their way to becoming commonplace in the hot-rodding world. Easy to install and tune, most kits include electronic tuning aids like a wideband O2 sensors and touchscreen monitoring. These EFI systems offer better gas mileage, throttle response, and are repeatable in any condition. 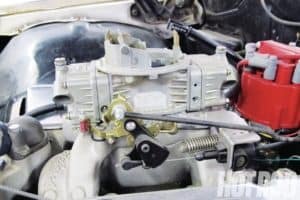 Companies like MSD Ignitions, Holley, Edelbrock, and FAST produce high-quality kits, but they cost much more than a carburetor. 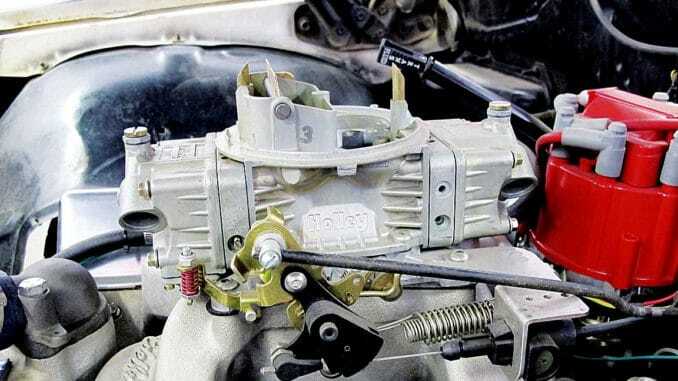 The cheapest throttle-body EFI retrofit kit costs around $1,100, while a new Holley four-barrel will set you back $269.97. Buy a Carburetor: If you need proven performance and great value. Buy Fuel Injection: If driveability is as important to you as horsepower. 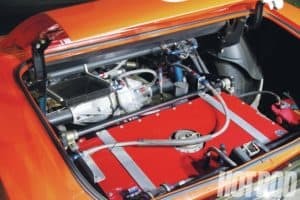 A fuel cell can potential shave 30 percent off the weight of a traditional steel tank, which is typically 6 to 12 pounds—not a huge gain for a weekend cruiser, but for the purpose-built race car a fuel cell is the obvious choice. New, both are comparable in price: $100-$120 for a 16- to 18-pound steel tank or 8- to 12-gallon fuel cell. A fuel cell often requires a unique and expensive fuel pickup and gauge. Mounting is another headache: in the trunk, cut out the trunk and make custom mounts, or let it hang low? A steel tank is an easy install, uses a standard fuel-pickup and gauge, and costs about the same. Buy a Fuel Cell: If you’re building a race car. Buy a Steel Tank: If you’re building anything else. When it comes to speed parts the line between “used” and “used up” is broad and varies depending on the type of the component in question. In general, items made from one material (preferably metal) and with few to no moving parts are OK to buy used. Buying an engine, transmission, axle, or steering box as a core is also fair game. Buying electronics, safety equipment, or anything that doesn’t come with a known background should be suspect. Remember, sometimes even “free” isn’t a good deal. Buy New Parts: If you are looking for a guaranteed result. Buy Used Parts: If it’s old, made of metal, or comes from a family member.